WASHINGTON (AP) — With a tantalizing tweet, President Donald Trump seemed to tease a positive jobs report on Friday, a protocol-defying step that moved markets and raised questions about the appropriateness of the president publicly hinting at information that could make or lose fortunes. Treasury yields jumped and the value of the dollar increased within seconds of Trump’s 7:21 a.m. tweet that said he was “looking forward to seeing the employment numbers at 8:30 this morning,” suggesting that traders likely were making investment decisions based on what they extrapolated from Trump’s post. The director of the White House National Economic Council, Larry Kudlow, said he briefed Trump on the jobs report on Thursday evening. One hour and nine minutes after Trump’s tweet Friday morning, the Bureau of Labor Statistics announced that 223,000 jobs were created in May, beating expectations, and that the unemployment rate fell to 3.8 percent. Though Trump’s tweet drew sharp criticism, Kudlow defended it as appropriate. The jobs data come out once a month and can lead to massive buying or selling trends on Wall Street, depending on how the information is received. Trump has made the roaring stock market a centerpiece of his administration and re-election campaign, though Wall Street has faced recent uncertainty due to the administration’s saber-rattling over tariffs. 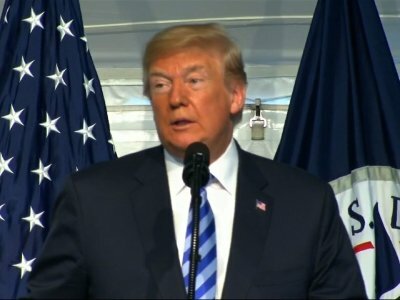 “We’ve reached yet one more historic milestone with 3.8 percent unemployment, just announced,” Trump said later Friday at a Coast Guard ceremony. With its power to move the markets, the jobs report is a closely held secret before it is released. Only a select few officials, including the labor secretary, the head of the president’s Council of Economic Advisers, the treasury secretary and the Fed chairman, are told prior to its release for fear that a leak could give some investors an unfair advantage. Trump’s embrace of the unemployment rate is a far cry from his 2016 campaign rhetoric when he called it “one of the biggest hoaxes in modern politics,” suggesting it was a phony number because it showed that the economy was expanding under Obama.